After saying goodbye to our team member Sarah and Waleed from the museum in Doha, we drove to Saudi Arabia and then to Abu Dhabi airport to pick up Eleni who arrived from Greece to join us. Eleni first met the Friendship Arabia team in Thassos during our Bahrain to Greece expedition and was fascinated with the idea of the tour. She asked if she could join one of our trips and was all the more interested in this tour since she had visited Oman last year and fallen in love with it. 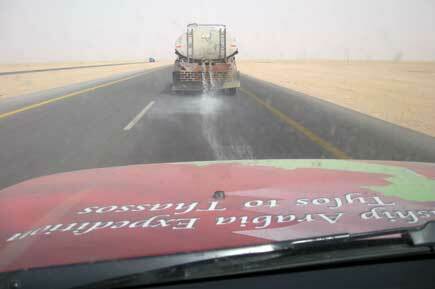 The drive from Doha to Abu Dhabi airport was long -- 610 kms in fact -- and when we met Eleni it was quite late at night. Still, we decided to drive to Al Buraymi in Oman, since we had a meeting with Governor Ebrahim Al Busaidi the following morning. Al Busaidi who is chairman of the photography club in Oman, knows team members Haider and Shafeeq from a photography trip they had done earlier. On Thursday morning Khadija, who works in the hotel Rosa Damascina, made us breakfast and hotel owner Ahmad Sadat, who was also our guide during our last visit to Syria en route to Greece, came and had a coffee with us and wished us all the best for the long drive back. It is very hard to leave Syria. Every time we visit this country, especially the capital, I am reminded of the quote by Ibn Jubair: "If there was a heaven on earth, it would definitely be Damascus." It is considered one of the oldest constantly inhabited cities in the world. Syria is also described as the most outstanding country in the world because it underlies the history of humankind in time and place. A journey through Syria becomes a journey of discovery filled with constant wonder due to the various arts, culture, civilizations and sense of beauty, and especially due to the overwhelming generosity of Syrian hospitality. After spending the night at Nigde for much needed rest, we visited Nigde Fort which used to serve as a jail in the republican era. The fort was completely restored in 2007. Since it is on a hill, it has become a popular spot for locals and tourists to sit and dine and look over the city. Yesterday we left Greece en route to Bahrain. We spent our last day walking around the little town of Chora, the capital of Samothrace. We had a light lunch before heading to the port where we took a ferry to Alexandroupolis. It was a relatively short drive to the border. Crossing the Greek-Turkish border went very smoothly. It was sad leaving Greece, we had such a great time there. The Greek people and government were very hospitable. We enjoyed the places we visited and we will miss our old friends and the ones we were very fortunate to meet this time around. After we left Philippi, we drove to Alexandroupoli, to take the ferry to Samothrace – it is just over a two-hour journey. 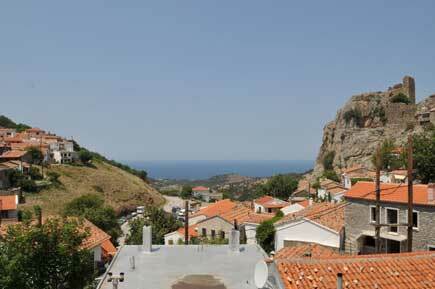 After our arrival, we drove to our hotel, Samothrace Village on the main road, next to the sea. 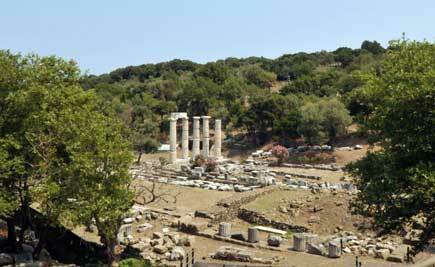 Samothrace is located in the northeast Aegean, opposite Alexandroupoli, 29 nautical miles distant. 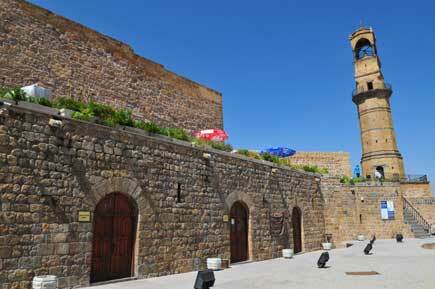 It belong to the Perfecture of Evros and covers an area of 178 sg. km, with population of 5,000. It is still relatively untouched by mass tourism. It was first inhabited in the Neolithic era, in around 1000 BC Thracian colonisers came here, intermarrying with the indigenous population. Afte we woke up the next morning, we drove to the Samothrace Museum for a tour and also visited the sanctuary, which attained its zenith in Hellenistic times. Then we drove to Therma for lunch and refreshment, after which we went to a small waterfall and met some locals who advised us to go to see the big waterfalls.